So this happened yesterday. 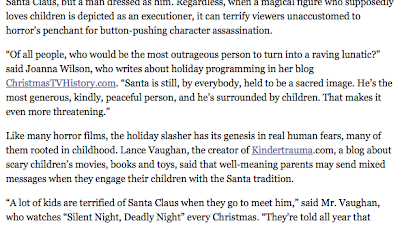 I was flipping around on facebook yesterday afternoon and discovered that a conversation I had with a New York Times writer was used in an article about the upcoming movie Silent Night, a re-make of 1984's Silent Night Deadly Night. The initial phone call with the reporter was several weeks ago--and you never can tell if what you say will end up in the finished piece. But I'm extremely pleased--to put it mildly. Apologies to my upstairs neighbor for all the shouting and celebrating that went on yesterday afternoon and into the evening, after we opened the champagne. 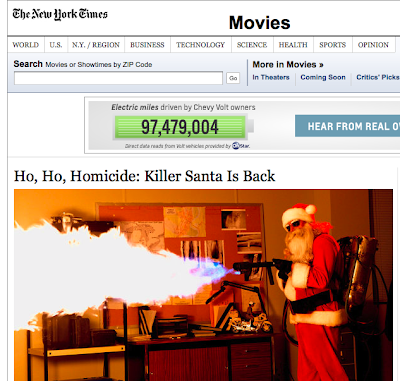 Here's a link to the article: "Ho, Ho Homicide: Killer Santa is Back" Check it out. 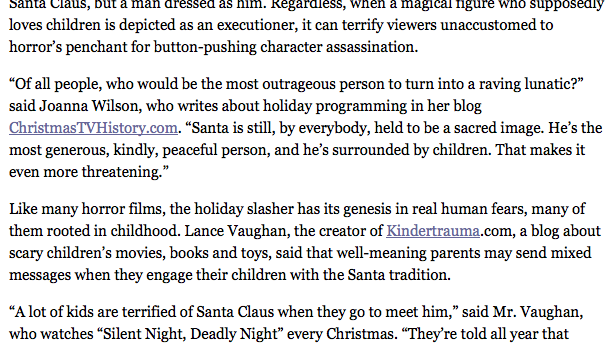 You'll also see that Lance from Kindertrauma was also quoted. If you're not already familiar with that website, you should check it out. YAYY!! We made the New York Times! If you're curious, my favorite killer Santa is from the 1980 movie Christmas Evil. The Santa in this movie is far more threatening to me because he is acting from a sense of moral righteousness as he punishes adults for being naughty. That's far more interesting to me--and more scary to me--than a mere madman. I can't wait to see the new Silent Night to see where they go with it.